The California Protea Association meets throughout the year (at least quarterly) at various locations. Often times one of our members will volunteer to host the general meeting at their own ranch. Sometimes we meet at the location of a scheduled tour or event and sometimes we land at the Gopher Hole restaurant, at Castle Creek Golf Course in Escondido. Meeting locations are always communicated well in advance by email. Our members run the gamut from large Protea growers with hundreds of acres, to small growers with less than 5 acres, and various sizes in between. That being said, we’re not ALL growers. Some of us are consultants, designers, or just plain enthusiasts. 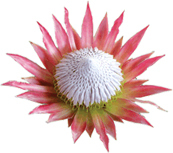 All you really need to join the CPA is a love of Protea! To get a better feel for who we are and the kind of things we do, check out Activities. We are always accepting new members and visitors are welcome. Feel free to come to our meeting as a visitor before you decide on joining our association. Just click the link below to see the Membership Form. It has all the information you will need about where to send it and how the dues are structured.